What a year it's been for Leslie Parnell!! Leslie, a Little Rock native, moved back home a couple of years ago from Chicago with her husband Charley and their then 9 year old son. Leslie and Charley settled into West Little Rock after taking on a major renovation of their home and began to settle in to their every day routine. Unfortunately, as many women already know, breast cancer has a way of disrupting life. Leslie is a firm believer in yearly mammograms, but she emphasizes the need for routine self examination as well. Her vigilance most likely saved her life! Take a look at how quickly Leslie went from screening and detection to the road to wellness. 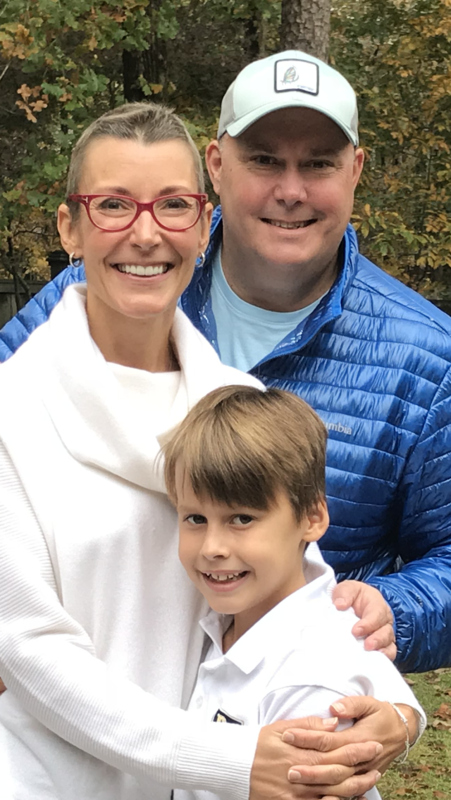 Her son's 3rd Grade Teacher, Mrs Leah McCarver of Pulaski Academy, a breast cancer survivor herself, helped to ease her student's anxiety and fears in a way only a teacher can! She sat down with him to answer questions, and on the day of Leslie's first surgery, Mrs. McCarver took him to the hospital to see his mom after school, so Dad & Leslie's mom could stay put at the hospital to care for her. Sweetness indeed! This year, 4th grade teacher Mrs. Jennifer Caffey will be baking cookies with her 4th grader so Leslie and Charley can have some time together after her upcoming final reconstructive surgery. A fine village indeed!! 3. You really can be Bald & Beautiful!! (Ok, she didn't really say that.) Leslie actually purchased a custom wig early in the process, and she even had a 'wig party' with her girlfriends to celebrate her path to healing. When it came down to it, Leslie felt it didn't quite 'fit'. As she states, it just "Never Felt Like Me". Of course, she completely understands why women choose to wear wigs while they're struggling through treatments and recovery, yet she felt it wasn't right for her. She wanted her son to see her as she was! It has opened up conversations with him and his young friends, as well as empowered other women to ask questions and hear her story. Rockin' her new 'do' also allowed her to freely get back into her exercise regimen, which was a big part of her everyday life. Leslie recommends all women (and men) get as fit as possible NOW, so that if or when illness strikes, your body can better handle the stresses and treatments, and can help speed recovery. Get Screened Ladies!! Then Self Examine! !